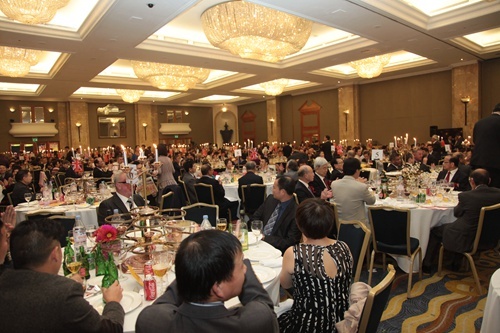 On 16 September 2014, over 600 representatives from various Chinese communities in the UK gathered at the Hilton Hotel London for a grand celebration on the 65th anniversary of the founding of the People’s Republic of China. Charge d’affaires Ni Jian attended and addressed the celebration. Charge d’affaires Ni first extended seasonal greetings and best wishes to all Chinese communities in the UK on behalf of Ambassador Liu Xiaoming and the Chinese Embassy in London. He recalled the brilliant achievements of new China in various fields over the 65 years since its founding, particularly since reform and opening up program was adopted more than 30 years. 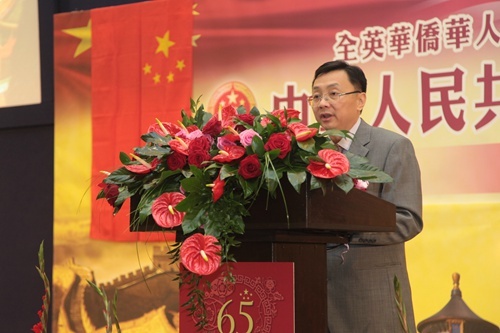 After briefing the participants on the economic development of China in the first half of 2014, the Charge d’affaires pointed out that the Chinese Communist Party is leading the Chinese people to overcome tough challenges and forge ahead towards a better future. This year marks the 60th anniversary of the China-UK diplomatic relations at charge d’affaires level and 10th anniversary of the China-UK comprehensive strategic partnership. In spite of some ups and downs, the bilateral relations have maintained a momentum of development. We have seen more high-level dialogues, deepening exchanges in various fields and improved cooperation between the two countries. These have proved to be fruitful. Charge d’affaires Ni commended the tireless efforts of the Chinese compatriots in Britain in participating in the revolution and development of China, promoting the China-UK friendship and upholding China’s territorial integrity and national dignity. He also thanked the compatriots for their generous donations following the earthquake in Ludian, Yunnan. Charge d’affaires Ni said it is the common aspiration of all Chinese descendants around the world to achieve the Chinese dream of the great revitalization of the Chinese nation. Overseas compatriots are indispensable to achieving the Chinese dream. He expressed the hope that the compatriots will carry forward the Chinese tradition of peace and friendly exchanges among nations, and actively integrate into and contribute to the mainstream society. He hoped that they will tell more China’s stories and live the Chinese dream. The Chinese Embassy will continue to follow the principle of “putting people first and conducting diplomacy for the people” and focus on improving consular protection and wellbeing of Chinese citizens overseas to safeguard the legitimate rights and interests of overseas Chinese. The participating compatriots highly praised the profound changes in the new China since its founding 65 years ago. They were proud of the brilliant achievements of the motherland and fully confident in the splendid prospects of the Chinese nation. They said the national flag and national anthem of China will always be the strongest patriotic melody in their hearts and the Chinese dream is a great dream of all Chinese people including overseas compatriots. They will continue to carry forward the excellent Chinese culture, work hard and actively integrate into the mainstream society with good faith and good neighbourliness, promote the development of China-UK relations and make new contributions to the prosperity of the motherland and the rejuvenation of the Chinese nation. The celebration was full of joyful and peaceful atmosphere. The video “Looking Back at History and Ahead to the Future” expressed in a unique way the greetings of the overseas Chinese in Britain to their motherland; the birthday cake enabled the participants to deeply feel the joy of the birthday of the motherland; and the wonderful art show demonstrated the earnest patriotism of the compatriots. Finally the celebration ended in the majestic melody of the chorus “I love China” and “Ode to the Motherland”.